10,000 to 40,000 lb. CAPACITY of meat scrap per hour depending upon applied horsepower, material and screen size. All wearing surfaces protected by RENEWABLE WEAR PLATES to protect case, easily and quickly removed for refacing or changing. SPECIAL STEEL SHAFT on 2-15/16" FAFNIR BALL BEARINGS with constant-sight OIL LEVEL FITTING. FULL FLOATING SCREEN! changes in seconds. All you do is lift it out (no tools - no loss of time) and presto-insert a new screen! MASTER-FABRICATED with 3/4" boiler plate case throughout. 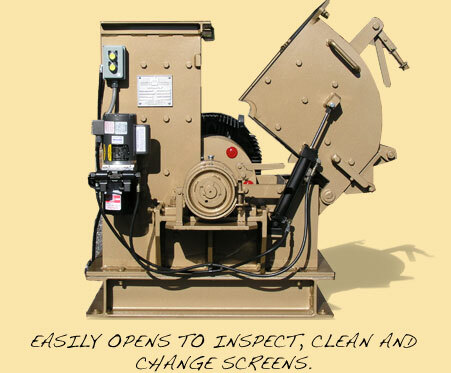 HAMMER MILL OPENS HYDRAULICALLY - a unique sure-action automatic closing device. ONE-HAND LIFT-TYPE LID OPENING LATCH. One, two, three, it's open in seconds. No tools and no loss time. FREE FITTING HAMMER PINS makes hammer changing a breeze. They stay tight-by centrifugal force. No fasteners needed. PERMANENT CHUTE may be attached as case can be opened without disturbing the feed opening. METAL TRAP built in for screen, hammer and case protection. DUST TIGHT, REVERSIBLE case for feeding from either direction. FOUR STAGE GRINDING MACHINE with Multi-hammer action for improved tonnage with lower power reguirments. Every milling machine PRECISION BALANCED BEFORE SHIPPING. LOWER HAMMER COST and HIGHER EFFICIENCY with LESS HORSE POWER means big savings for you.